Gay Weddings Algarve - Algarve's premier gay wedding planners Portugal, specialising in organising your dream wedding in the algarve. 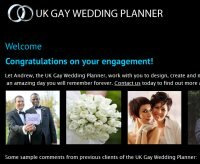 Let Andrew, the UK Gay Wedding Planner, work with you to design, create and manage your perfect wedding or civil partnership – an amazing day you will remember forever. Contact us today to find out more about the packages we offer.